THE foundation for Hans Petter Moland’s actioner is a 2014 Norwegian film “In Order of Disappearance”. Memorialising that title is a series of slides during the course of “Cold Pursuit” telling us the gang nicknames of the bad guys whose demise we have just witnessed. That’s just one of the many subtle moments of humour in a film in which a lot of bad guys get their comeuppances at the hands not of the police force in Kehoe in the Colorado snow country but of Nels, who operates the snow-plough clearing the road between Kehoe and the luxury hotel nearer the slopes thus saving well-heeled skiers and snow bunnies from having to go far for après ski frolics. Nels gets angry when his son gets shot by a goon employed by drug mogul Mister Big. The film is about how, to the confusion of the cops and the neglect of any kind of conventional morality, Nels goes on the warpath. A bunch of Indians also targets Mr Big whom they believe wants to take possession of their land. That, in a nutshell, is what “Cold Pursuit” is about. The nutshell is big enough to hold a lot of goons and a small delegation of Indians. And as the goons die in small groups, Frank Baldwin’s adaptation of the story ramps up the tensions to nice proportions pretty much in step with the laughs, some of which you need to be quick to notice, others that you mightn’t expect to find in an actioner. 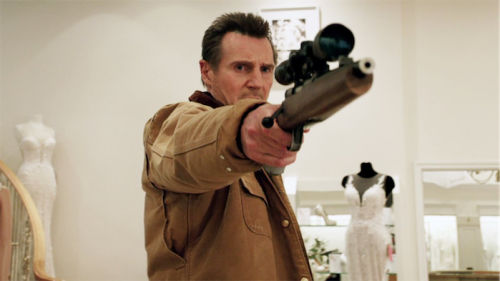 Liam Neeson plays Nels, a man with a mission. Tom Bateman is ruthless gang chief Viking who’s more funny ha-ha than he thinks. The shoot-out resolving it all is spectacular. The winter landscapes make the exterior scenes almost resemble brilliant black-and-white photography. It’s well-made escapism untrammelled by message or morality.